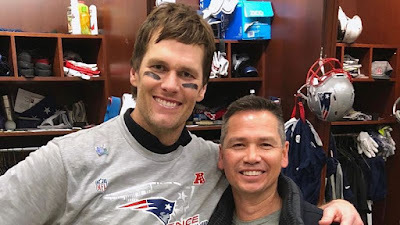 The 617 Report : Brady should have handled the Guerrero questions differently. Had he done so he would have creating avoided a national story. Brady should have handled the Guerrero questions differently. Had he done so he would have creating avoided a national story. By now you have heard Brady cut this morning's weekly interview with Kirk and Callahan short. I think Brady went about the interview the wrong way, and as a result created a bigger headache for himself than he would have had if he just answered (or dodged) the questions. Throughout his career Brady has been terrific at dodging questions that he does not want to answer in order to avoid headlines and distractions. In the past three years he has had to answer dozens of questions regarding deflate gate, Trump, Guerrero, and his relationship with Belichick. 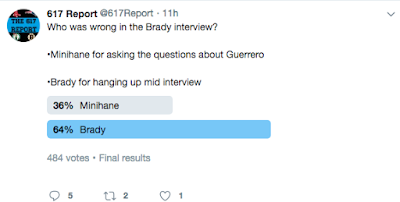 When Minihane initially asked Brady about Guerrero taking the team plane, it was clear from the tone of his voice that it was not a topic that Brady wanted to discuss. Brady: "You know, I don't want to; I'm not getting into that." Minihane followed up saying that when he spoke to Guerrero at the Super Bowl, he said that the tension between himself and Belichick had been overblown, and that they had a pretty good relationship. Minihane asked if Brady would say this was true. Brady again diverted, saying "I said I don't want to get into that." So far I have no problem with how Brady handled the interview. I would like to hear about Guerrero, especially because his presence at the game on Friday was a story over the weekend. However, if Brady just says that he doesn't want to discuss it then I don't have any problem with it. It's his choice whether he wants to speak about it or not. Minihane was about to move on: "Ok, go ahead Evan (Drellich)." Brady jumped back in: "Yeah. Everybody knows, it's well documented the work he and I do together." Here was Brady's first mistake. The conversation is about to move onto a completely new topic when Minihane begins to turn the interview over to Drellich. Instead, the interview stays on Guerrero. This isn't the first time that Brady has done this. Albeit a different topic and a different tone of the interview, Brady kept the conversation going on a hot topic when discussing Trump in his pre-Super Bowl interview with Kirk and Callahan in 2017. Callahan initially brought up the fact that Brady would face blowback if he admitted to calling Trump and congratulating him on winning the election. Brady didn't particularly answer the question directly, but instead noted that he is a positive person and that he tries to live his life by trying to take a positive approach in all aspects of his life. After Callahan followed up and jokingly asked what is not great in Brady's life, he asked Brady if he did in fact call Trump to congratulate him on his victory. Brady stated that he and Trump have had a relationship throughout his career and that Trump has been supportive of him throughout the years. When Minihane moved on to a sponsor read, Brady cut him off and asked "What makes (his friendship with Trump) such a big deal?" This resulted in the Trump conversation continuing for a few more minutes. The discussion about Trump was less contentious than the conversation about Guerrero. However, in both situations Brady continued the interview and it ended up leading to a conversation that would create a national story. Having done a weekly interview with Minihane for six years, he has to understand that Minihane will follow up when Brady keeps the discussion going. By getting annoyed and hanging up mid-interview, Brady only draws additional attention to the conversation. I don't think that ESPN, CBS, Pro Football Talk, and everyone in between would have picked the story up had he not hung up the phone early. I don't blame Brady for being annoyed with the questions about Guerrero after having to answer questions regarding deflate gate, his relationship with Belichick, and Trump on what seems like a weekly basis over the last three years. However, he has to understand that as one of the biggest stars in sports he will continue to be asked these questions. It is the media's job to ask the questions because their listeners and readers are interested, whether they say they are or not. If it is a story about Brady, people want to know the details.